On Friday's Smallville, "Sacrifice," a bunch of characters died, one hero was mutilated, and a certain femme fatale kicked it (only to come back from the dead minutes later). Richard Pryor with a sombrero this show ain't. Spoilers ahead. - Tess breaks into Watchtower, and Chloe catchers her in the act. Suddenly, Watchtower goes on lockdown, because Checkmate has hacked Chloe's files. Chloe and Tess must break out (lest they asphyxiate), but there's one big problem: Checkmate has placed a subcutaneous tracking parasite in Tess. End result: Watchtower is destroyed, and Chloe must electrocute Tess to death (to disable the parasite) and resurrect her with atropine. The gals bond over their near death experience. - Oliver confronts Zod. Zod gives him a recruitment spiel, and Oliver plugs him with a Kryptonite crossbow bolt. Oliver makes the rookie mistake of turning his back on the Big Z for five minutes to call Clark. Zod wakes up and carves a big Z into Oliver's chest à la Zorro. Bummer. - Clark learns that Faora is pregnant with a little Callum Blue. Zod overreacts when he hears that Faora offered to negotiate with Waller, and strangles her to death. Then - in an immensely creepy scene that has never appeared in an issue of Action Comics - he listens to his unborn baby's heart stop beating. The scene both humanizes (or Kryptonianizes) Zod and is terrifically ham-fisted. It was giving me flashbacks to Revenge of the Sith, big time. - Zod is mighty miffed that he's killed his unborn child, so he laser-eyes Amanda Waller and Checkmate agent Stuart Campbell to little charred shreds. Are they dead? We don't know. If so, they died off-screen. We do get to see Zod toss Pam Grier into a windshield like a sack of potatoes. This episode was mostly window dressing for the season finale showdown, but - my goodness - was it doom and gloom. Only weeks ago, we were having bed and breakfast and banshee fun-time. This episode introduced Clark to Zod's Kandorian army and further teased us with the identity of the Red Queen, but other than that, it was just a bunch of simmering plot lines coming to a full boil. 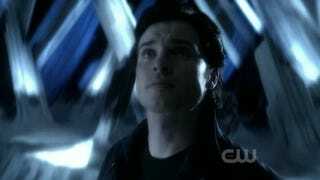 It wasn't a bad episode, but I wish there was a wee bit more of that kitschy Smallville charm to leaven the moroseness.